"We, in Syria, are very keen on the historic and strategic relations between Syria and Russia- Former Soviet Union- , which have always worked for security, and peace in the world," said His Excellency President Bashar Al-Al-Assad during his Summit Meeting with His Russian Counterpart, Dmitry Medvedev. "There are many issues to be dealt with during our meeting today- August 21st 2008- on top of which stands the situation in the Middle East and the recent crisis in Caucasus," added H. E. President Al-Assad reiterating the Syrian support for the Russian stance related to Abkhazia and South Ossetia saying " We comprehend the Russian stance and the Russian military response to the provocation; we appreciate the courageous decision taken by the Russian Leadership in responding to the international initiatives starting to withdraw its troops." H. E. President Al-Assad noted that his talks with President Medvedev is to deal with Mideast peace Process and the indirect negotiations started recently between Syria and Israel with the mediation of Turkey saying " Russia has always been supportive of the Peace Process , and we are to deal with the active role that Russia might play in this regard." Interviewed by the Russian Kommersant Daily, President Al-Assad reiterated Syria’s rejection for he ongoing bids as to circumvent Russia saying " We stand against all such bids; hence, for us, this is a continuation for the US policy since Cold War era. What Russia has taken of measures- regarding Caucasus crisis- is but the defense of its legitimate interests." Asserting the Syrian preparedness to cooperate with Russia as far as whatever might bolster its security. His Excellency said, in reply to another question, "Naturally, the issue of military cooperation is a fundamental one. The buying of weapons is very important though of some bureaucratic obstacles at times, whether for production reasons or for financial difficulties. There is a need to speed matters knowing that the US and Israel have always been exerting pressures on both Russia and Syria." President Al-Assad noted to the role played Israel and its military advisors in Georgia , "We are aware of the wide scope of Israel influence in Georgia ; the reports of closeness between the US and Israel is no secret . We hope that Russia were to realize clearly this role played by Israel in Caucasus crisis." In reply to a question regarding the news about Syria’s buying of Russian Arms sending them to Iran, His Excellency said " if we were to evaluate the matters objectively, the relations between Iran and Russia are very good; Iran’s Air Defense System is a Russian made one, and is more modern than that which Syria has. Thus, we have to buy such a System from Iran and not the opposite." In reply to question regarding a naval blockade by the US or a strike against Iran, President Al-Assad pointed out that the current US Administration is that of war; naturally, war is the objective of this Administration. However, a war against Iran will not be an easy stroll for the United States; the consequences of such a war would not include only the Gulf Region, or the Middle East, but would spread all over the entire world." "Russia has great potentials; therefore Russia has to remain a super power," said President Al-Assad, in reply to another question, noting to the efficiency of the current Russian policy. In reply to a question regarding the Lebanese situation, President Al-Assad said "Hezbollah is now a very big political force; it has ministers in the government. Hezbollah, I believe, establishes in a correct manner its relations with other political forces in Lebanon, and enjoys increasingly the masses support." In reply to a questing regarding the US coming Presidential elections, President Al-Assad said "We do not care about change of power in the US; hence all the administrations leave as inheritance for consequent administrations a ball of fire. Even if an administration similar to the current one were to come to power in the US, it is doubtful, that such administration is to commit the same mistakes previously committed. If those who want to practice politics in a more correct manner were to win the elections, there would be very limited changes. Thus, we do not have to pin big hope to this effect." Regarding the indirect negotiations between Syria and Israel with the mediation of Turkey, His Excellency said " We search now for the possibility as to achieve result in the peace process. The essence of the cause is the restoration of the occupied territories, and the demarcation of the borders between Syria and Israel. We have made it clear for Israel that no peace between us is to exist, as long as our occupied land is not restored in full." In reply o a question about joint coexistence in Syria, President Al-Assad said " The traditions of the Syrian Christians and Moslems’ living peacefully together is one of the most important characteristic of our people; we have also a Jewish Community. In Syria live many of the Russians. The most ancient Church exists in Damascus." According to Itar-Tass, The Syrian leader said in an exclusive interview with Itar-Tass and ORT television ahead of the Moscow visit that he will raise at the talks the matter of purchase of new armaments and further development of military-technical cooperation with Russia. He believes the setting up of joint ventures by Syrian and Russian businessmen, specifically, in tourism, is a promising trend. "This process has begun and is bearing fruit. It should be given every encouragement," Bashar Al-Assad said. The Syrian president will discuss in Moscow "a broad range of questions related to political, as well as commercial and economic partnership." He intends to discuss with Russian leaders the Middle East situation and the course of the indirect peace contacts maintained with Turkish mediation. He said the talks with the Israelis that started after a prolonged pause "are still at the initial stage, and nothing significant has yet taken place at them." Nevertheless, he expressed the hope that "the situation in the Syrian-Israeli direction of the peace process may change by October or later with the growth of confidence between the sides." Bashar Al-Assad confirmed "return of the occupied Golan Heights remains the question of top priority for Syria." He said as well in the interview that Russia’s actions in the South Ossetian crisis were legitimate and adequate. "We cannot view what happened in the Caucasus apart from other consistent steps of the United States and its allies aimed at weakening Russia and lessening its role on the international arena. The question of human rights, the events in Chechnya and anti-Russian actions of a number or governments that came to power in ex-USSR countries were used for the same purpose in the past," the Syrian leader said on Tuesday. 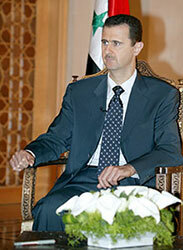 Bashar Al-Assad described the present situation regarding South Ossetia as "a dangerous relapse to the cold war." Russia had no other choice in conditions when the rights of its citizens and its own interests were affected and there emerged the threat to stability in the Caucasus, the Syrian president holds. He believes, "The actions of the Georgian leadership should be regarded as an error." The conduct of the United States and of a number of Western countries regarding Abkhazia and Ossetia is a glaring example of the policy of double standards, the Syrian president stated in the interview. Presidents Al-Assad and Medvedev held talks on the standing historic relations between Syria and Russia, Mideast Peace Process asserting the Syrian right to restore the Golan Heights, where the Russian President voiced support and willingness as to provide whatever necessary to make success of the indirect peace negotiations between Syria and Israel moving them to direct negotiations . Furthermore, Presidents Al-Assad and Medvedev’s viewpoints were identical regarding the situation in Iraq, timetable for foreign troops withdrawal from Iraq, and the reaching to a national consensus among all the political forces of Iraq through a national comprehensive dialogue. Both Presidents asserted that no solution for the nuclear issue of Iran is possible but with a diplomatic means asserting Iran right to possess Nuclear Power Technology for peaceful purposes. Regarding the situation in Caucasus, H. E. President Al-Assad voiced Syria’s support for the Russian stance in its response to the attack carried out by Georgia against South Ossetia condemning the double standard measures practiced against Russia by some countries with regard to this issue.